Getting The Best Deal Makes A Trip Heavenly. KillerStartups > Startup Spotlight > Getting The Best Deal Makes A Trip Heavenly. Ask someone where to look to find the cheapest plane tickets and you’ll likely get as many answers as there are birds in the sky. It’s easy to go crazy trying out different search engines and travel sites, wondering if your timing is right, if there’s someplace you’ve forgotten to check. Why can’t there be one site to do all the work for us? Value Airlines may offer just the ticket we’ve been searching for. Is it time for Kayak to start paddling harder? 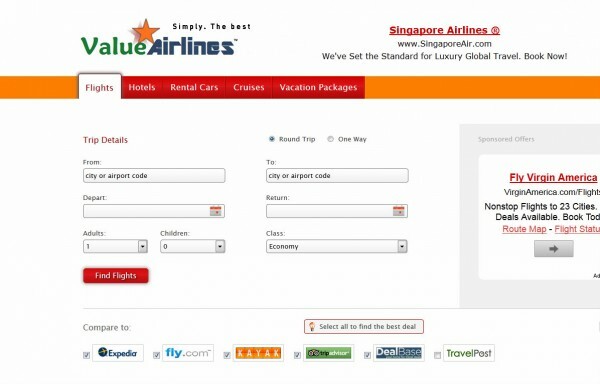 ValueAirlines.com is a travel search engine – a free service for shopping for airline tickets and other travel needs. Search for cheap fares and then compare pricing against other travel search sites, all in one place. The aim of this startup is straightforward: to help people locate the best travel deals. But finding the lowest rates and best value is always easier said than done. So, what does Value Airlines have that the others don’t…? For grins, I thought I’d check out flights from Chicago to L.A. next week. In case Hollywood options my screenplay. You never know, right? The cheapest fare that turned up onsite was $318 with Spirit Airlines. I’d never even heard of this airlines before. Big points to Value Airlines for pointing me toward a carrier that I wouldn’t have thought to investigate on my own. What’s more, Value Airlines opened windows that allowed me to compare rates on Priceline, fly.com, Expedia, Kayak, DealBase, and TravelPost. There’s nothing like shopping around for travel deals to bring out the obsessive-compulsive tendencies in all of us. No matter the results, we continue to ask: “What have I missed? Where else can I look? Where can I find an even cheaper fare? Value Airlines saved me the time I surely would have spent reentering the same information on multiple sites hoping to dig up better savings. The last option, TravelPost (a search engine that probably wouldn’t have come to mind), alerted me to potential last minute fares, dropping the price to as low as $247. Aha! Confirmation that there was still room to both improve and expand travel search engines. 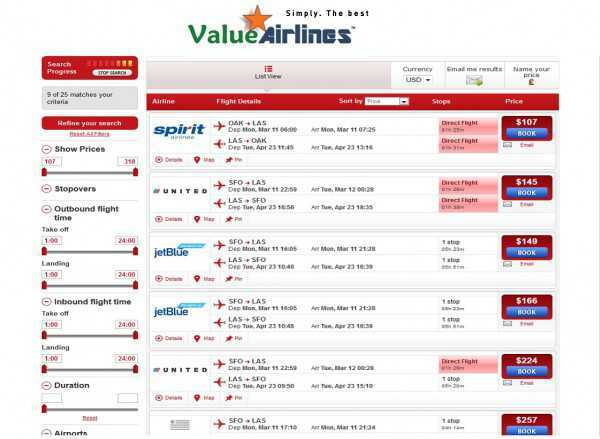 Time will tell; maybe Value Airlines is the end of the line, THE comprehensive, one-stop search and comparison site. Value Airlines is a subsidiary of Asian Airfares Group, LLC, based in San Francisco. Founder and CEO, Drago Maximov, also heads Buy-Online.com – a shopping version of Value Airlines, where people can compare the prices of products in numerous online stores. To stay in the loop on the latest news and breaking deals, find Value Airlines onsite or using their free app.